I wanted to let you know that I will NOT be posting the cute little scarecrow of which you have seen a photo here. He has been problematic with the outline feature. I am not happy about that and in order to correct it would have to redo the whole design. So, I am deciding to NOT post him but instead tell you where you can get him and a whole set like him by a more experienced digitizer. Also, if you join her yahoo group, you can still get the little fellow for free. So, go visit: bettysoriginalembroideries.com She has some great and very reasonably priced designs. Looks like Betty and I both like the country style designs and have both purchased graphics from Trina Clark’s website. Enjoy. Also, to show you what I have been working on lately, I posted the photo above. 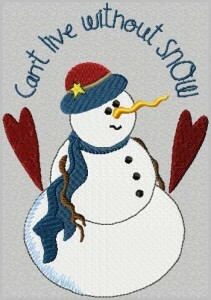 It is the beginning of a set of snowmen as well as some CHRISTmas designs. Thought I should be focusing my attention on that rather than on more fall designs. Have a great weekend and talk to you later. Sorry you are having such fits with that design. He is a cute one. I have Betty’s and that’s really nice of you to point people toward her site. I LOVE that new snowman you’re working on though. He’s adorable too. I logged in to get the scarecrow but the like just took me to a sale page saying this domain name or business is for sale? So wonder what is happening. Thank you for trying. You are correct. It looks like that domain is for sale. I guess that particular design is no longer available.